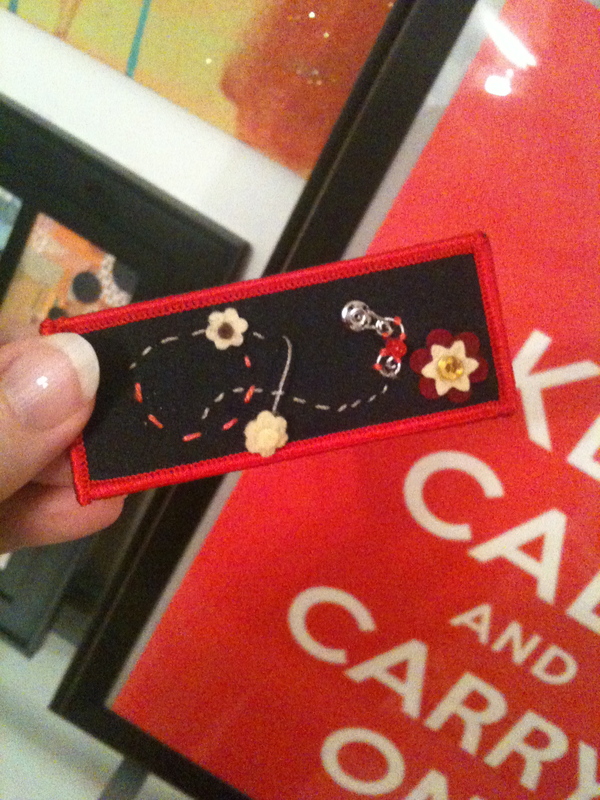 Nowviskie's Soft Circuit Merit Badge: close the circuit and light the red LED by clicking the flower (sewn with conductive thread) to the metal snap. We’re planning the class to appeal to experienced and inexperienced participants alike. As a warm-up exercise, we’ll take on this concept from Evil Mad Science Laboratories: a merit badge that (if you’ve sewn the circuit correctly) merits itself, by lighting an LED. My prototype is above (and see it light up here). It should be fun to see the variety of battery-powered, glowing nerdiness our fellow THATCampers design! This has just been a teaser post. Time permitting, I’ll share some other wearable tech concepts before the 20th. Bring your thimbles, if you’ve got ’em! Just a quick follow-up to say HOW MUCH FUN we had, to thank Bill Turkel and all of the participants, and to share some pics from the event.